Ceiling fans allow you to raise the thermostat setting about four degrees without discomfort. A ceiling fan cools people, not the room, so be sure to turn it off when you leave the room. In the winter, reverse your fan to force warm air near the ceiling down into the room; the blades should be set on a low speed and spin in a clockwise direction. 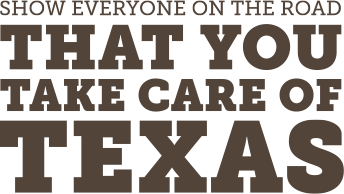 Each Texan generates about 6.5 pounds of garbage every day. By recycling paper, metal, plastic, and other materials, you can reduce waste, help conserve energy, and preserve our state’s natural resources. In 2015, Americans generated about 262 million tons of trash and recycled and composted almost 91 million tons of this material, a recycling rate of 34.7 percent. Used electronics account for 1.2 percent of the municipal solid waste stream, and is steadily increasing. The average household has approximately 28 electronic devices. You can help by purchasing refurbished electronics, or reusing or donating used electronics, as well as recycling them. Most rechargeable batteries can be recharged up to 1,000 times, but when they no longer hold a charge—recycle them. If every Texas household recycled five rechargeable batteries a year, we could keep over 47 million batteries out of landfills. Visit Call2Recycle.org to find a battery drop-off site near you. Buy products, such as office supplies for home and work, made from or packaged in recycled materials. Items made from recycled content are manufactured with fewer virgin materials. You can usually spot products made from recycled paper, plastic, and other materials by reading the labels. One ton of paper manufactured from recycled paper saves up to 17 trees and uses 50 percent less water. Consumers and businesses receive more than 78 billion pieces of junk mail each year; most of this ends up as solid waste. If you decide that you don't want to receive pre-screened offers of credit and insurance, you have two choices: you can opt out of receiving them for five years or opt out of receiving them permanently. The Direct Marketing Association's Mail Preference Service also lets you opt out of receiving unsolicited commercial mail from many national companies for five years. Important: Both secured sites are recommended by the Federal Trade Commission and will ask for personal information.